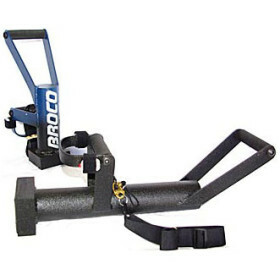 Broco® BABY ENFORCER™ Door Ram » Protective Solutions, Inc.
Broco® series one-man door rams are engineered for rapid forced entry by tactical teams and first responders. The BABY ENFORCER™ is 16" in length and weighs 25 lbs, shown towards back of image. Full-sized ram is 24" in length and weighs 38 lbs, shown at front of image. ENFORCER™ ram features unique design ergonomics to maximize striking impact while maintaining a neutral wrist position throughout the arc of the Breacher's swing. The ENFORCER™ ram can be thrown overhand, underhand or from the side using a natural motion that derives energy from the hips and shoulders as well as the arms. Users find it's like swinging a baseball bat or throwing a punch.